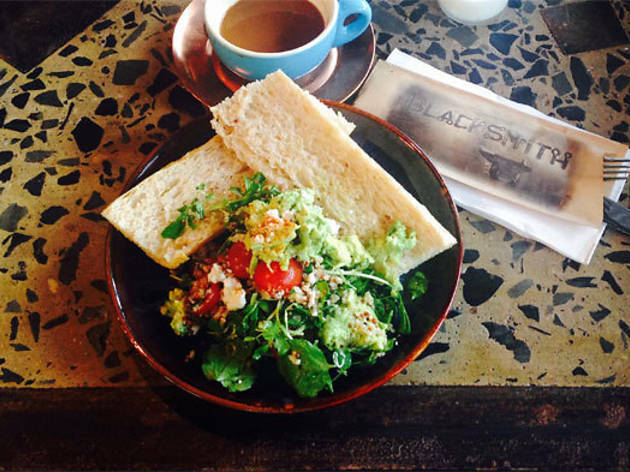 This inner city outpost of Mona Vale's Blacksmith Café is bulking up the coffee offerings around Central. 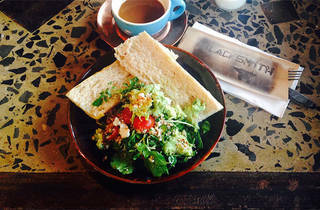 It sits right across the street from Prince Alfred Park, home to Sydney's prettiest parkside pool, and slings toasties, house-baked granola and a Smithy breakfast burger (pesto fried egg, bacon, cheddar cheese, pickled slaw, beetroot relish and chilli jam on a wholemeal brioche bun) to the post-swim crowds. If you're eating on the run they do a five-dollar pastry and coffee takeaway special on weekdays, but they relax the pace at lunch to allow time for confit pulled chicken and a soft shell crab burger. They've finally locked down their liquor licence, too – which means they're open late from Thursday through Saturday and serving up a bar menu that includes Sydney rock oysters, seared cuttlefish, chicken karaage and bagna cauda, a collection of seasonal vegetables served ice cold with warm parmesan anchovy sauce.